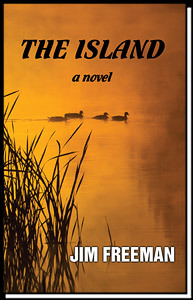 The Island takes place on an ageless 800 acre duck hunting club on the Illinois River, land where the Illini Indian Confederation dominated for centuries before the white man came to North America. One can feel their presence. Hank Edson owns the island and it’s more than a playground for this Chicago contractor, it’s built with his sweat and dreams, the very essence of Hank’s powerful life. But the island comes with its own legacy, the old time market hunter and local redneck, Gart Haggard. Not a young man, Gart’s life-long reputation is that of an outlaw poacher, hot-headed and dangerous one moment, soft-spoken and generous the next. In his unsettled mind, the island is his by some strange birthright and the only way to achieve his goal is to drive Hank off this land. Fire is and always has been his weapon. A chilling story of two men in deadly conflict, the one honorable and immovable, the other arrogant and unstoppable, their confrontation growing as slowly and inexorably as Spanish moss. Hank is not a man to be driven off anything, particularly this ancient and mystic land that’s so much a part of his soul. And thus the story unfolds. Set in a last best place where hunting ducks is inseparable from the character of the land, anyone who has sat out a cold, wet morning in a duck blind will be drawn to The Island. This is a story about fire; that which scorches land, consumes homes, and takes lives, but also the fire that burns in the mind: obsession. For Hank Edson, a contractor from Chicago, the island is a playing field on which he pits himself against the forces of nature and his adversary, Gart Haggard, a local ne'er-do-well bent on running him off his property. In a shocking twist, a chain of events is set into motion that jeopardizes Hank's marriage, friendships and ultimately his life. The lush countryside of Southern Illinois has been expertly rendered in The Island, as well as the mores and idioms of duck hunting. The reader is transported to a special part of the world: a place where the land and its people have become one.